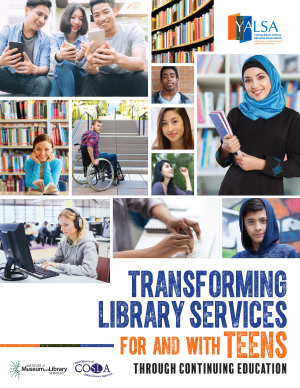 It’s been a year since YALSA and the Chief Officers of State Library Agencies (COSLA) started work on the Transforming Library Services for and with Teens Through Continuing Education (CE) Institute of Museum and Library Services (IMLS) project. In that year the two organizations hosted a National Forum on the topic, sponsored virtual town halls to learn about the needs of library staff as they relate to teen services, and interviewed library staff and stakeholders to learn about models for successful CE. Multi-part series that give participants the chance to take a deep dive into a particular topic. Multi-part series that acknowledge more than one approach may yield success and which provide participants with the opportunity to critically reflect on their learning, integrate it into real-life practice, then join with other learners and facilitators to evaluate how implementation went, and try again with changes based on the assessment. CE that enables partnerships and collaborations between library workers and those in other fields including education, technology, leadership development, advocacy, and diversity and inclusion is critical to supporting the learning needs of all library staff. It is clear in the findings of this report that CE that is a one-and-done experience and that doesn’t provide opportunities for practice, feedback, and reflection is less successful than CE that takes place over time and allows for integration into daily practice. ACRES, a National Science Foundation funded project led by the Maine Mathematics and Science Alliance (MMSA). In this project Afterschool staff, including library staff, take part, with a small cohort of colleagues, in virtual learning. Using the Zoom platform staff meet to talk about a topic related to facilitating learning, practice what was discussed, record their practice, and meet again for feedback and reflection. The ALA Libraries Ready to Code project (sponsored by Google) in which a cohort of 30 libraries join together in a community of practice to discuss successes and challenges in implementing computational thinking literacy learning through libraries. The CoP includes weekly live meetings, a discussion forum, and exchange of materials used in activities. You can read the report, YALSA’s new statement on continuous learning, and access more resources related to this work on the project website. Stay tuned for more information from YALSA on how the association’s own CE will change to better align with the findings of the new report.